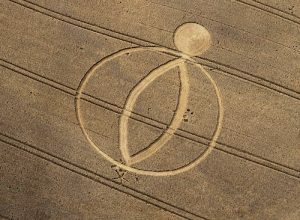 The “crop circle” you see here was discovered August 3, 2010 at Pewsey Wharf, Wiltshire, on August 2010. Compare this “crop circle” with the one featured in the video below. The differences are entirely obvious. The video below, created by Tyler at SecureTeam 10, is well done and brings to our attention several unique characteristics of genuine crop circles that support the contention that some crop circles are not created by people. Brightly lit UFOs being video-recorded over a UK crop field are featured in the beginning of the film. Such happenings remind us of why crop circles have, like UFOs, been subject to ongoing efforts to discredit any notions of their non-human source. Crop circles have been “collateral damage” in the decades-long campaign to debunk UFOs because of their close association with them. If crop circles had been allowed to be embraced by the public and regarded as gifts to mankind from a non-human source, the UFO cover-up would have quickly fallen apart. Along with UFOs, crop circles had to go if the UFO cover-up was going to survive. And so it has been.